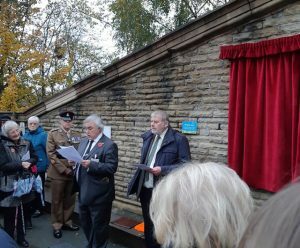 The Friends of Sowerby Bridge have unveiled a new bronze memorial plaque commemorating the fallen of World War One, at the West Yorkshire station. 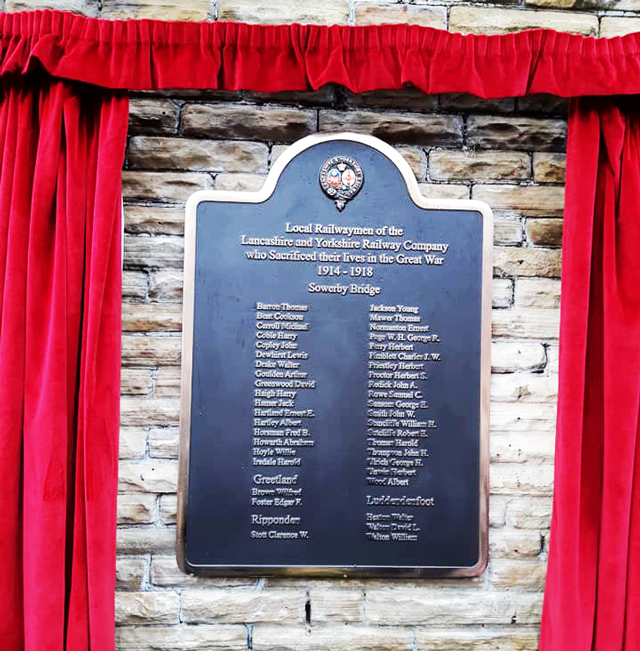 The plaque records the names of the 42 former railwaymen based locally at Sowerby Bridge, Greetland, Luddenden Foot and Ripponden who lost their lives in the First World War. The names were researched by member and local historian John Hartley. It has been achieved thanks to grants from various organisations, including Northern and ACoRP, and personal donations from group members and other members of the local community. A crowd of around 100 attended the official unveiling of the memorial plaque on Remembrance Sunday, 11 November 2018, following our annual remembrance service at the station. The unveiling was carried out by Valerie O’ Neill, mother of local soldier Corporal Kris O’Neill (of Sowerby) who served as a medic with the Royal Army Medical Corps and was killed when a roadside bomb exploded under the armoured vehicle he was patrolling in on 5 April 2007 west of Basra City in Iraq. Wreaths were placed by Sir Gary Verity (Deputy Lord Lieutenant of West Yorkshire), W/O Mark Murray on behalf of The Yorkshire Regiment, David Norton on behalf of Northern, Sheila Robinson on behalf of the Friends of Sowerby Bridge Railway Station and Valerie O’Neill. The Rev Dr Ben Gordon-Taylor conducted the Remembrance Service and the bugler of local ensemble, Breakaway Brass, performed a perfect Last Post.